How Well Do You Know Your Types of Paints? 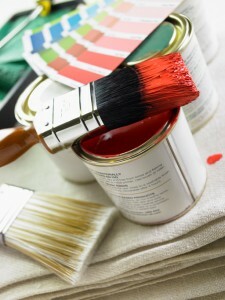 Did you know that there are different types of paints for painting different types of surfaces? Your choices in paint color are seemingly endless, but there are actually only a few major types of paints you really need to familiarize yourself with. Before you even decided on a color, you should know the type of paint you are going to use. This will help the project run much more smoothly, and it will help you avoid costly mistakes. Let’s take a look at the major types of paints you need to know about. Water-based paints are the largest types of paints that are sold for wall painting today. If the surface you plan to paint has been covered by an oil-based product, the new paint may not stick correctly. If you use a water-based paint on this type of surface, you should wash the surface and roughen it with grit sandpaper. When you make it clean and dry, it will help to prevent your new coat of paint from peeling and ruining all of your hard work. Some of the advantages of water-based paints are that they are easy to cleanup with water, dry quickly, offer a flexible finish that is resistant to cracking, and provide a stable color over time. The other type of paint you should familiarize yourself with is oil-based paints. This type of paint is popular for painting furniture, doors, glossy woodwork, and surfaces like floors. One of the reasons oil-based paints are so popular is that it offers an attractive gloss that is hard to match. Oil-based paints also provide a durable finish. Matte paint is known for having the least reflective sheen available. It appears as if it has a velvety texture, and matte paint can help to hide imperfections in your ceilings and walls. Also, matte paint offers a tremendous depth of color. Most new homes use it as the standard sheen for walls, but keep in mind that it can sometimes be difficult to clean. Eggshell offers a reliable level of durability but it does have a certain level of reflectivity. Because of the durability, though, eggshell paint is often used in bathrooms and kitchens. Semi-gloss and gloss paints have the most reflective sheen and are highly durable. Semi-gloss and gloss paints are often used on doors, baseboards and moldings. Aside from offering a beautiful color, semi-gloss and gloss paints do unfortunately tend to highlight any imperfections in the objects that you painted. Do you need some great paint to get started on your painting projects in Howard County this summer? Columbia Paint Company is your one-stop shop for all of your home decorating needs. We have everything you need to make your dream home design a reality. Schedule an appointment with one of our design consultants today!